We spoke backslang on our council estate they deported my father to the bullring in Birmingham and buried him alive in one of the support columns. It was a pity because he was a university professor. None of us liked him though. Since being deported, I've learned a lot. Mostly, I've learned about the natural foods that can be foraged in the forests of South America. The natives here don't taste as good as the citizens of Scarfolk, but beggars can't be choosers. I see no reason why such an enlightened policy should be limited to the County of Scarfolk, and would like to see it fully implemented into the Greater United Kingdom, having confirmed that my ignorance and vulgarity is insufficient to warrant mandatory deportation (one of my children I am not so sure about, but he frequently wonders off and is likely to be disposed of safely by the Junior Detonation Task Force anyway). Is there any chance you might see your way to proposing it on petitions.parliament.uk ? (Or giving your blessing to someone else trying?) I would very much like to see my ignorant and vulgar neighbours (not the nice ones) deported, particularly those that vote incorrectly or do not clean up their dog's pooh. 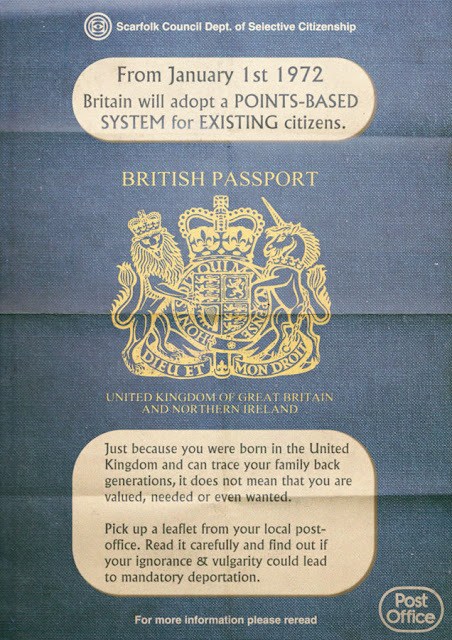 Scarfolk once again showing that reality imitates art.